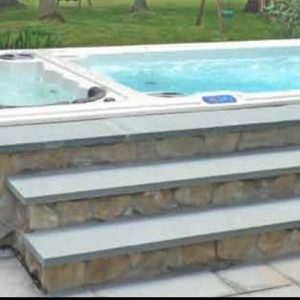 Beachcomber Hot Tubs Pool and Patio is the official dealer for HydroPool Swim Spas in Lethbridge and area. HydroPool swim spas provide the ideal training environment for both athletes and casual swimmers alike. Both are ideal for swimming, jogging, exercise or play and provide a large pool experience in a small, easy to maintain, safe pool space. You can easily bring the swimming experience to your backyard! However, buying a swim spa can be overwhelming. Here’s a guide that will explain six basic things you need to know. Download a FREE “Guide to Buying a Swim Spa” eBook. For more product information, download a FREE “Hydropool Swim Spa” eBrochure. Give us a call or come into the store for more info on our Lethbridge swim spas! Been Thinking About Summer & Swimming?